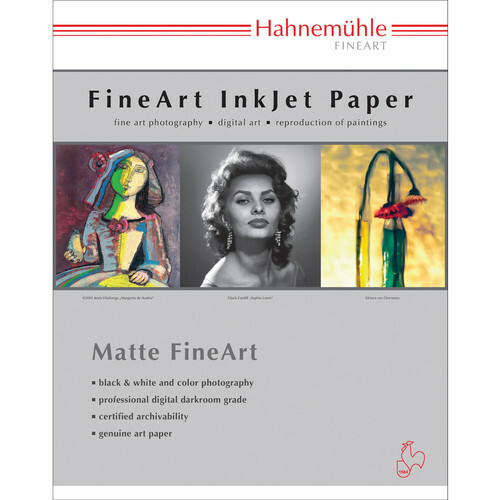 This 25-pack of 17 x 22" William Turner Deckle Edge Matte FineArt Paper from Hahnemuhle features a heavyweight 310 gsm paper that was designed for archival purposes and has a hand-torn deckle edge on all four sides. It is mould-made from cotton rag to produce a textured matte finish. This gives it a heavy weight, which combines with a 24.4 mil thickness for a professional look and feel. Also, the paper features an 88.5% whiteness and an opacity of 99% for a classic white finish. For archival purposes no optical brighteners were used in this paper. It is also acid free and calcium carbonate buffered to avoid negative effects from the environment. Additionally, William Turner paper is instant drying and water resistant. Box Dimensions (LxWxH) 22.5 x 17.5 x 1.0"
William Turner Deckle Edge Matte FineArt Paper (17 x 22", 25 Sheets) is rated 5.0 out of 5 by 1. Rated 5 out of 5 by tekneektom from Wonderful, Artsy Paper I've used the William Turner Deckle Edge (17x22) in my Epson P800 with fabulous results. Great color (I downloaded ICC profile. The paper does really well in a floating frame. Where can I find the ICC profiles for this paper? I have a Canon P-1000 printer. I looked on Hahnemuhle's site but they don't show profiles for this particular paper.